Attention room moms and school volunteers! 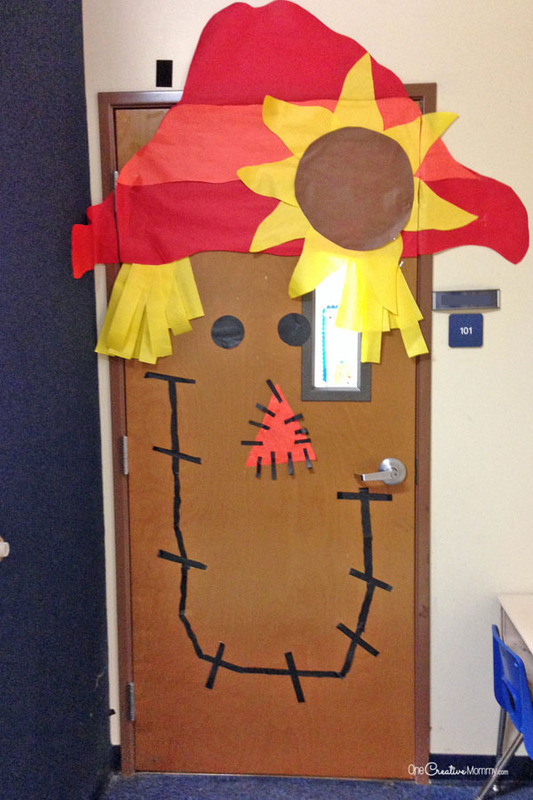 Are you in charge of classroom door decorations for Halloween this year? 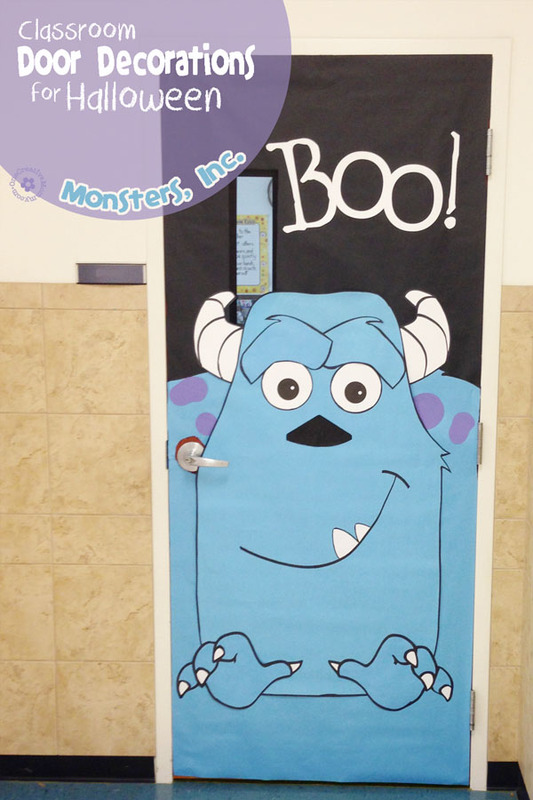 Check out these cool (and easy) Halloween door ideas. I only created one of these doors, but I’ll do my best to give you some tips for creating the others. As usual–parents are so creative when it comes to designing doors! Love all of these. 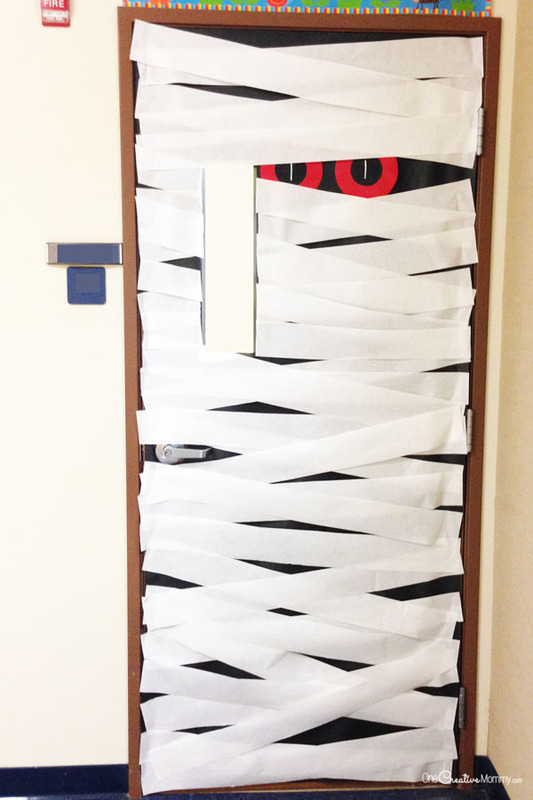 Simple Mummy Door — First cover the door in black paper. Next, add the eyes. Finally, cover with random strips of white paper. Monsters, Inc. Door Idea — This one will take a little bit more time, but I’ve provided a tutorial and printables to help you out. Visit this link for directions and printable hands and facial features. 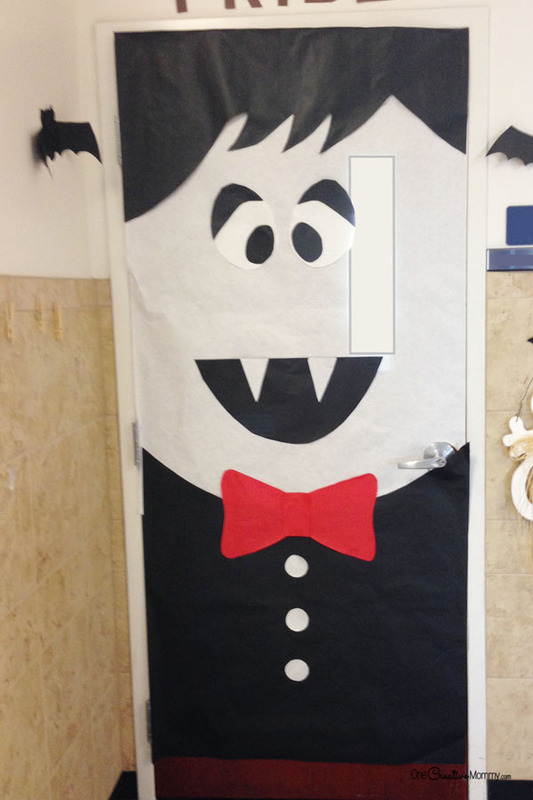 Dracula Door — Cover the top 2/3 of the door with white paper, and cut the other basic shapes out of red, black and white. 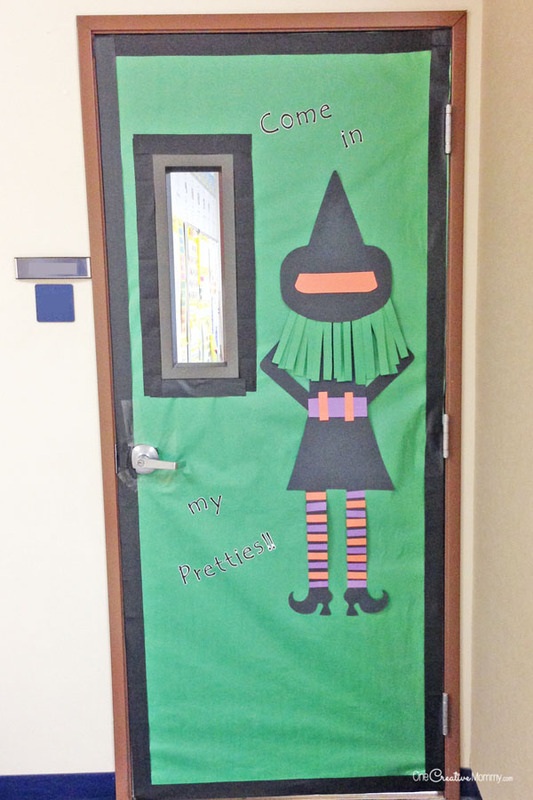 Striped Witch Door — Don’t worry about being fancy. Notice that the only part of the witch not created with basic shapes is her shoes. If you can cut a straight line, you can probably do this. Create the trim for the door with black crepe paper. 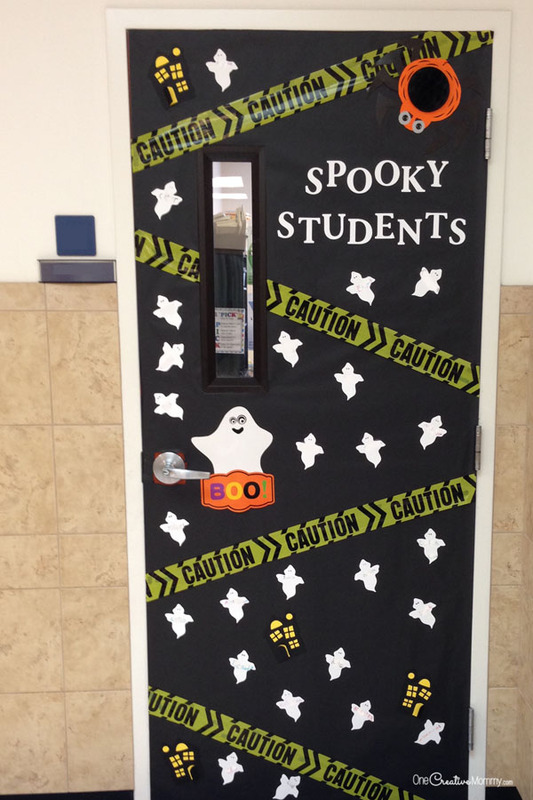 Spooky Students Door — It looks like the ghosts and haunted houses were printed using a die cut machine (many school have them in their work rooms) or with a cutting machine like a Silhouette cameo. If you don’t have access to any of those things, try the dollar store. You might just be able to find a ghost-shaped packet of paper. 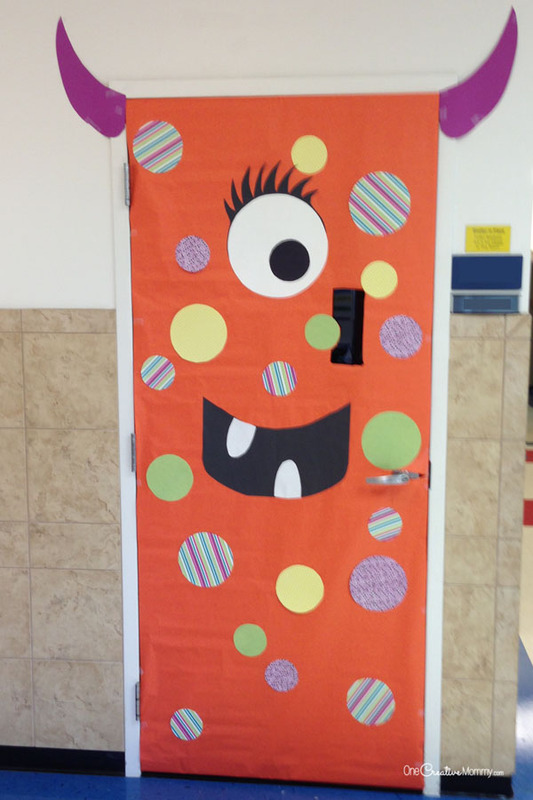 Polka Dotted Monster Door — This is one of my favorites! Cover the door in any solid, bright color. Use tupperware lids to trace circles out of scrapbook paper. Freehand the mouth, teeth and horns, and turn the largest circle in to an eye. You can do this one — and it look so cool! Frankentstein Door Idea — This is another super simple one. 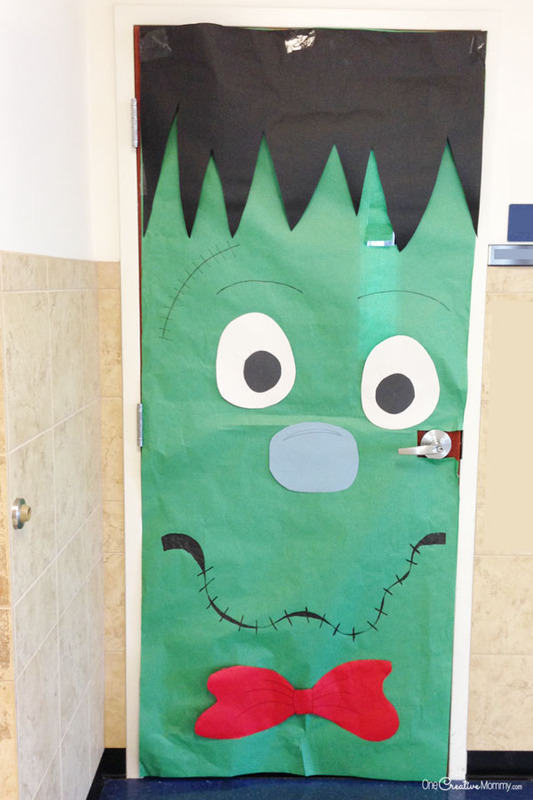 Cover the door in green, add a few touches with paper cutouts, and then draw on the details with a black sharpie. 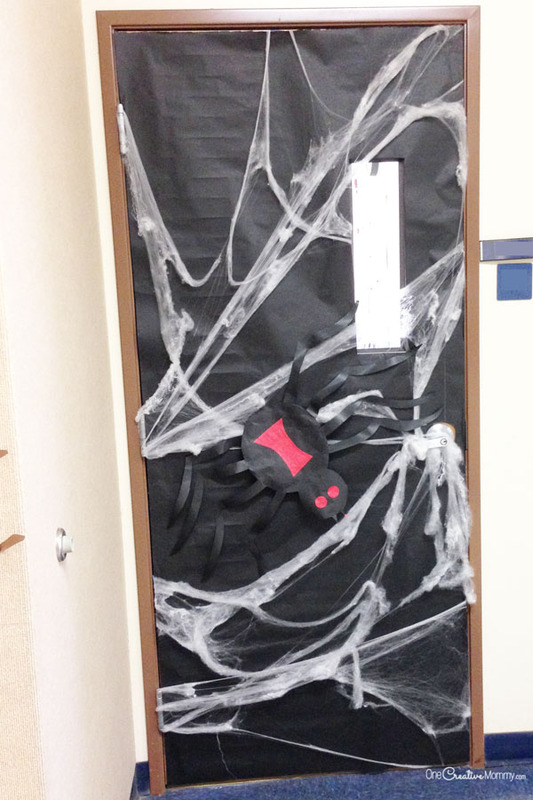 Simple Spiderweb Door — You know all of those spiderwebs that you can buy after Halloween for super cheap? Grab extras to use on classroom doors next year! I think you could cover the door in any color behind the web. 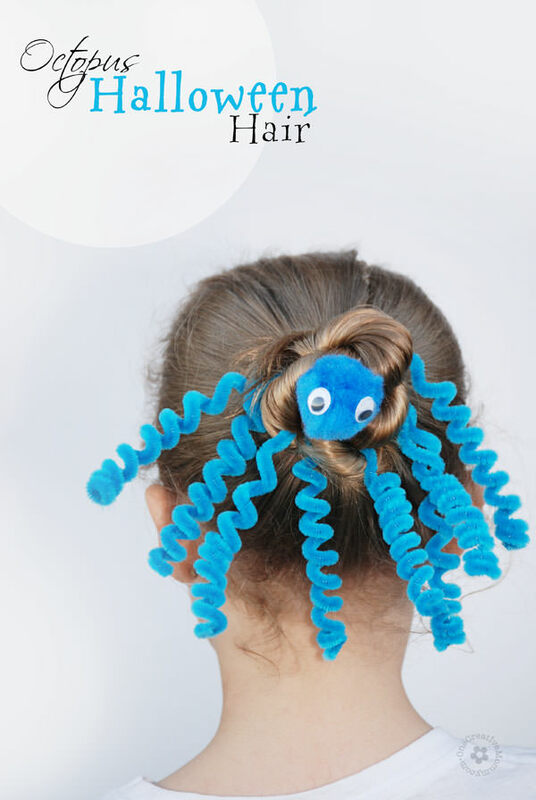 You could even use a store bought spider. 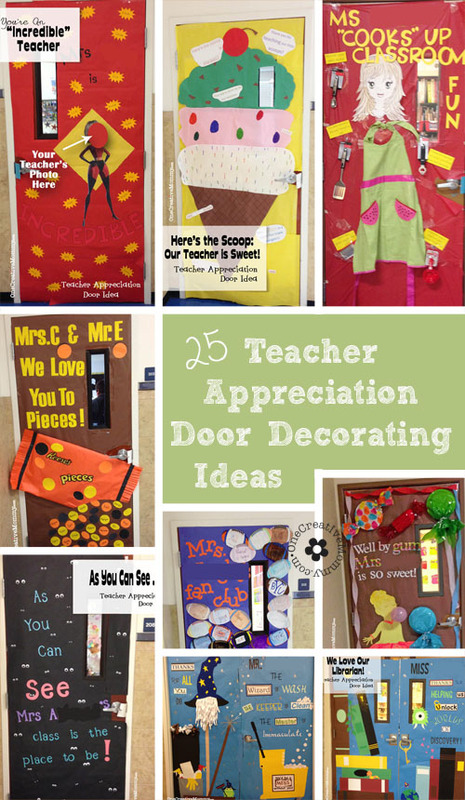 (Just don’t be surprised if you find the kids taking it off the door and taking it out to recess to play)! 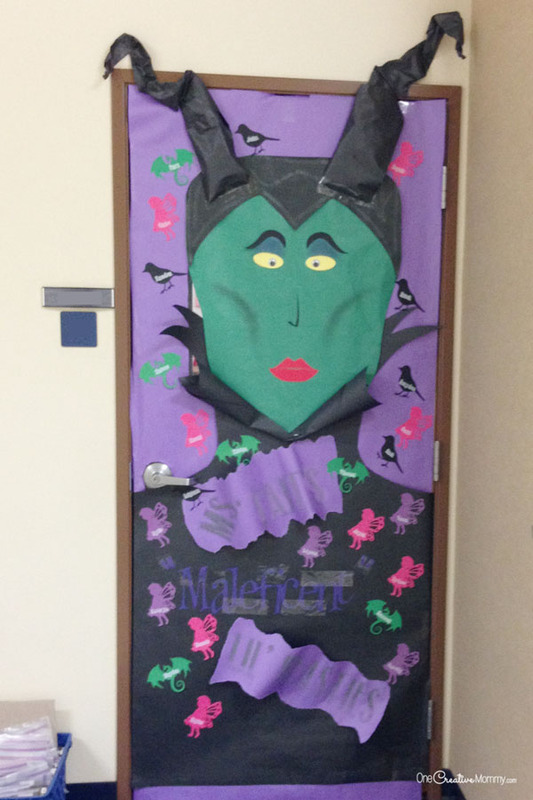 My teacher is Maleficent — I’m afraid I can’t tell you exactly how to create this cool Maleficent, but I bet if you study the picture, you’ll find the basic shapes. Some of the pieces are created with paper curls. Caution Tape Door — Last but not least, the Caution door. If you have little time, but want to create a fun and creepy feel, just grab a few rolls of caution tape and get wrapping! I love the addition of the spider web with tiny black spiders crawling through it! 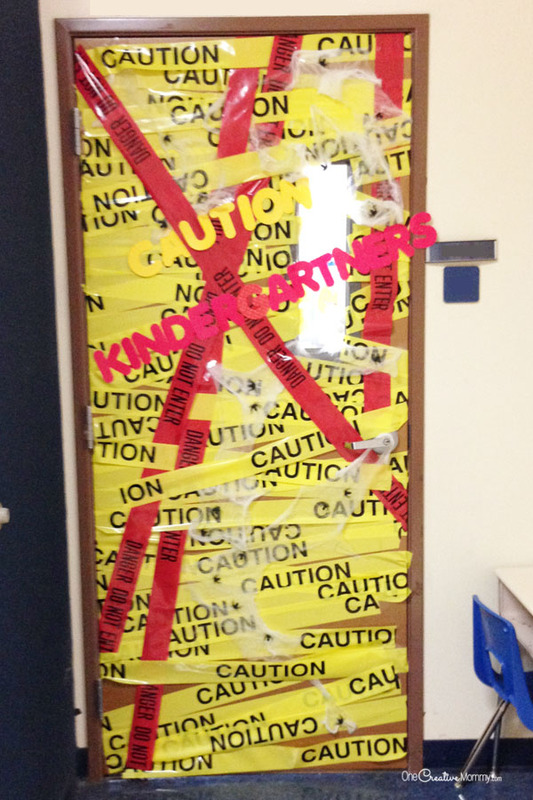 Have fun door decorating this year. As a former teacher, I know that the teachers really appreciate it when room moms and volunteers take care of fun things like this for the class. I hope you enjoy these ideas. I’d love to hear what you’re doing for your kids’ classes. I’ve got too more exciting guests for Spooktastic September next week. 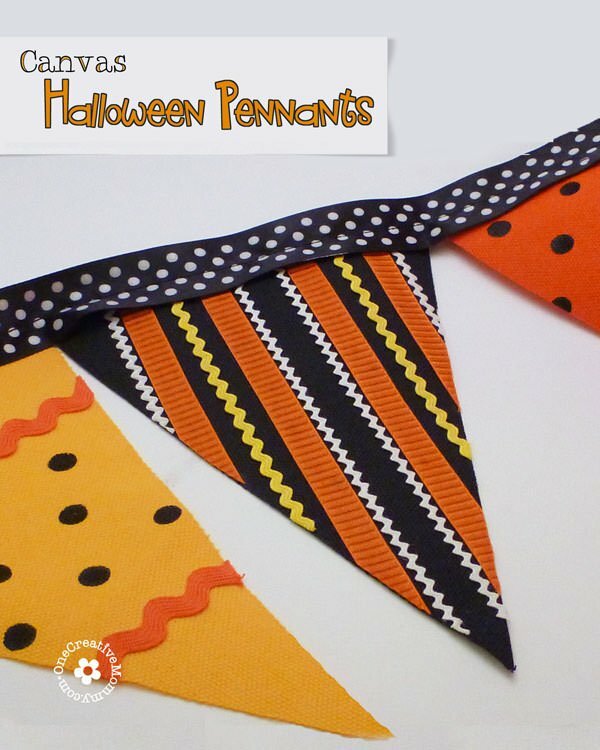 I hope we’ve given you lots of great ideas to get you prepared for Halloween decorating next month! Thanks for stopping by today. I hope you stick around and see what else I’m sharing. You’ll find the posts below by clicking on the images. These are all so creative and I can’t decide which one I like best . . . but that polka dot monster sure looks easy and so cute! Thanks, Lisa. The polka dot monster is definitely one of my favorites, too! These are all sooooooooooooooo beautiful and soooooooo creative!! I can’t even make up my mindwhich is my favorite….. Thanks, Winnie. The parents in my area are so creative! We homeschool so I suppose that means all the doors in our house could be classroom doors. 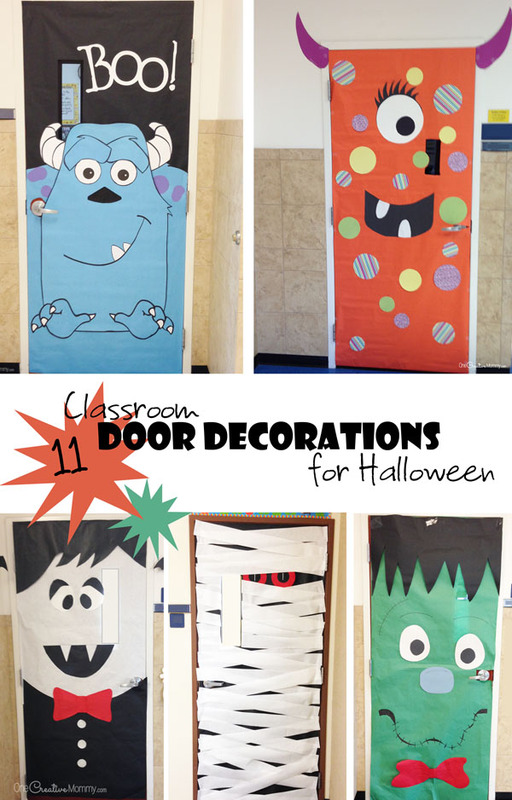 I’ve been contemplating doing some door decorations with the kids this year, and these are all just too cute! I love it! Thanks for sharing. These are all so cute! My favorite is definitely the Sulley bur the scarecrow is a close second. You are so creative Heidi!